St. 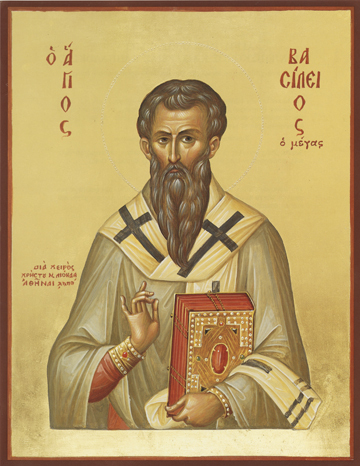 Basil was born in Cappadocia about 330 a.d., the eldest son in a most pious family, many of whom later became saints, including his mother, St. Emmelia, his brothers, St. Naucratius, St. Gregory of Nyssa and St. Peter of Sebaste, and his sister, St. Macrina the Younger. He was very bright and went to Athens to study when he was still young, studying with Gregory, later the Holy Bishop of Nazianzus, and with Julian, later the Emperor of Rome and Apostate from the Faith. St. Basil was steeped in philosophy and learning, yet humble and meek. He was baptized as an adult in the River Jordan when visiting Palestine. St. Basil spent some time with monks in Egypt, and years later formed a monastic community and wrote a basic rule of the way of life for his monks. He was chosen Archbishop of Caesarea in Cappadocia, served with honor for ten years, and wrote a Divine Liturgy. He was a great champion of theology of the Holy Spirit being an integral part of the Most Holy Trinity. He fought those heretics in writing who opposed this. St. Basil died full of virtue and good works, going to his Lord when just 50 in 379 a.d.